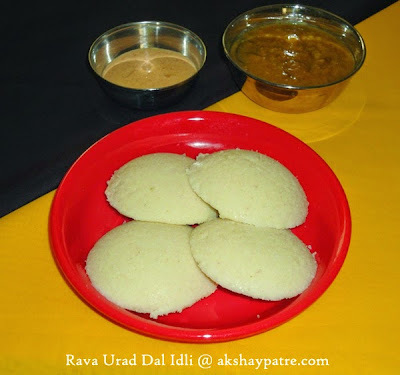 Rava urad dal idli recipe - I am fond of all South Indian idlis. This rava urad dal idli is an alternative to rice urad dal idli. The interesting part of this idli is that the batter doesn't need any fermentation. Dal needs to be soaked for three hours and your idli batter will get ready within half an hour after grinding it. To make it more interesting, you can add green peas, carrot, chopped curry leaves, coriander leaves, green chillies and spluttered mustard seeds to it. But, we like it plain and I made it without adding any tempering and vegetables. I served this rava urad dal idli with sambar and coconut chutney. Dry roast the rava till raw smell disappears and set aside. Allow it to cool. Wash and soak the urad dal for 2 - 3 hours. Drain the urad dal and grind it to a smooth paste adding some water. 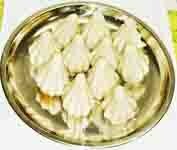 Transfer this urad dal paste to a vessel. Add the roasted rava, water and salt to the urad dal paste. Add required water to make the paste of idli batter consistency. Mix and combine well and keep it aside for 30 minutes. Then grease the idly plates and pour the idli batter with a table spoon. Pour required water in the idly cooker and arrange the idli plates in it. Place this idli cooker on high flame and cook the idlis for about 15 minutes. Once the rava urad dal idly is done, remove and serve the rava idli hot with choice of your chutney and sambar. Idli's looking soft and spongy with side dishes yummy breakfast..Please do visit my blog thanks. Nice recipe.. Love such instant no ferment idlis.. Looks soft..